BADMINTON SET. Power down the electronics and enjoy a friendly competition of badminton. This set comes complete with two badminton rackets, three feather shuttlecocks and a carrying case so you can head to the beach or out to your own backyard. HIGH-QUALITY CONSTRUCTION. Lightweight yet durable, the rackets are made using a top-quality aluminum head and steel shaft. This makes it easy for you to handle the racket while allowing for a balanced swing. VERSATILE USE. 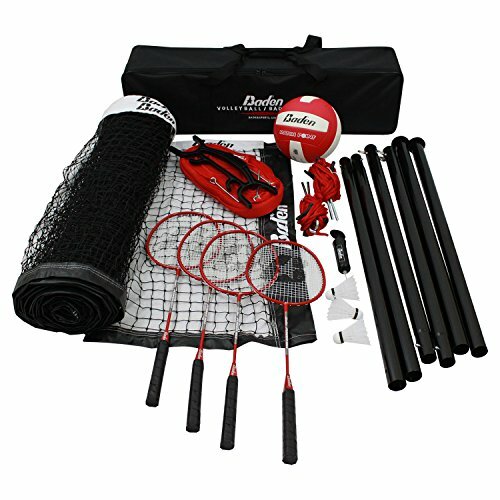 Whether you're hosting a backyard barbecue, a family reunion or simply going to spend a family day at the park, this badminton set will enhance the fun. Take it with you on all your adventures and start a rally wherever you go. FEATHER SHUTTLECOCKS. You won't have to stop playing every time a shuttlecock is out of reach. This set comes with three feather shuttlecocks stored in a case for easy access, so you can continue playing with fewer interruptions. STYLISH COVER. 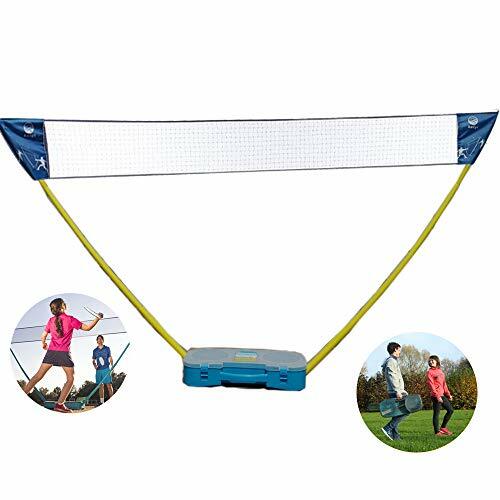 You can head outdoors to play a badminton game without having to search for equipment or carry all the items at once. The Pro Impact comes with a stylish, carrying case so you can easily transport the set wherever you want. This badminton set includes two rackets, one blue and one pink, measuring 16" tall with 9"x8" hitting area. The hitting area is made of string/mesh material making the racket lightweight and fast. Also includes a ball and a birdie. Suitable for children of ages 3 and up. Your kids will love playing with this racket indoor and outdoor! You can have a back and forth game without having to have a net like badminton. It is perfect for training hand eye coordination in beginners! A perfect toy game that combines eye hand coordination, power, strength, speed and decision making skills. BADMINTON SET: The innovative racquet game that requires no net. The badminton set consists of 2 giant sized colourful racquets with short handle that are perfect for kids. It includes a ball and a birdie. 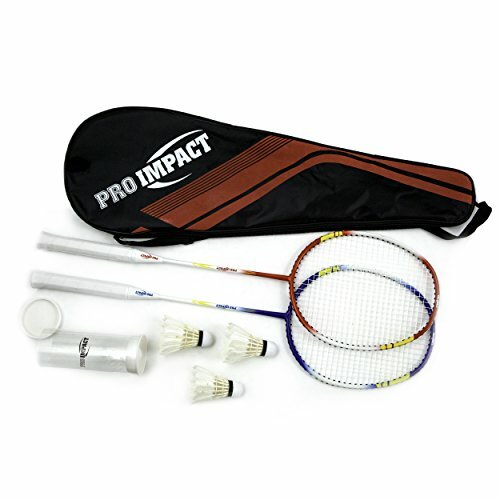 FOR KIDS & BEGINNERS: This badminton set has a large mesh-stringed hitting area with short handles, which makes it light in weight and faster in action. It is perfect for parent-child games and badminton beginners. SPECIFICATIONS: The racquets are 16 in length with 9x8 hitting area. The ball has a diameter of 2 and the birdie measures 2.7. This set is made from good quality plastic with smooth surface, so there is no need to worry about getting hurt. FUN SET: The set is great for playing indoors and outdoors! It develops kids' reaction, hand-eye coordination in beginners and enhances your physical health. 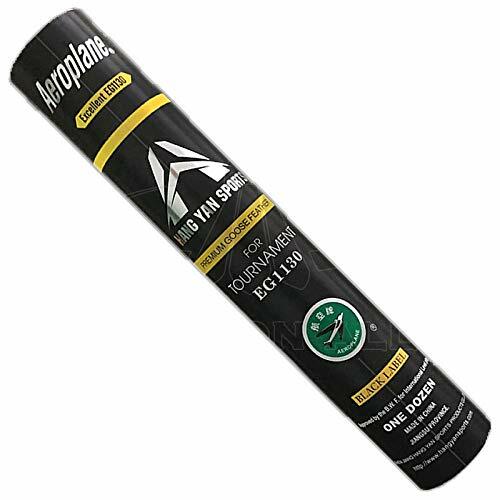 It is perfect over short distances, as well as for the beach, park or backyard. 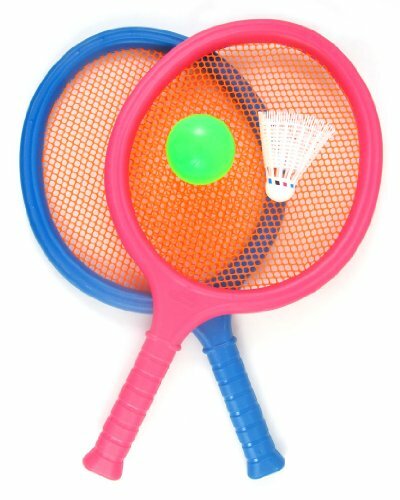 AMAZING TOYS & GIFTS: The badminton set is a fantastic toy for kids. Your little ones will love playing with this beautiful pair of racquets both indoors as well as outdoors. It can also be gifted as a birthday, Christmas gift for boys and girls. 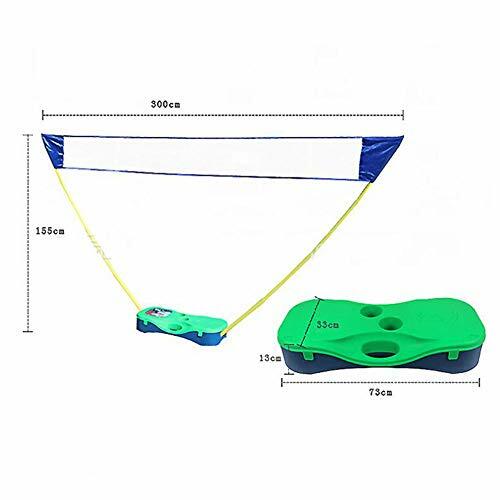 Speed badminton / crossminton is the innovative alternative to tennis, badminton, spike ball, beach ball and other beach games for adults and kids, providing ultimate fun. The young sport combines the best of other racket sports and inspires young and old all over the world in clubs, leagues and tournaments - play without a net, whether indoor or outdoor, in the backyard or the park, on tennis courts or at the beach. 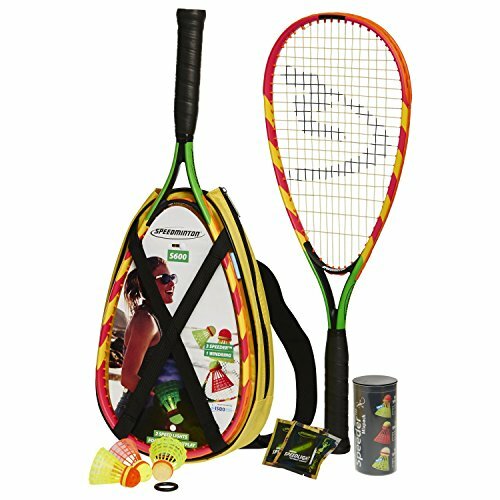 Brand: Speedminton | Manufacturer: Speedminton Sporting Goods Corp. Serve up some fun at your next family gathering or backyard BBQ with the EastPoint Sports Easy Setup Badminton Set! Have fun faster! This set assembles in less than 5 minutes (color may vary). Get a four-player rally going in this fast paced game! Test your reaction time and hit the shuttlecock back and forth over the net! Play singles or doubles. This set is sure to be the ace of any occasion! OUTDOOR FUN: Perfect to use for the beach, set-up in the backyard, or carry along to the tailgate! 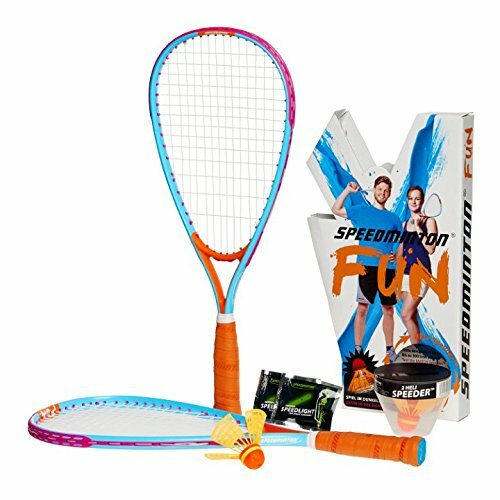 The Speedminton FUN Set is great for the ultimate leisure outdoor game fun with family and the perfect beach game for adults and friends over short distances and at night. 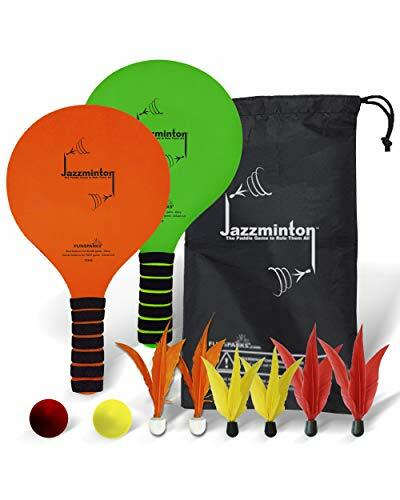 The perfect beginner set, as an alternative to badminton, spike ball and beach ball, includes two original Speedminton rackets that are shorter compared to badminton rackets and are much lighter than tennis rackets. It also includes two innovative birdies, the HELI Speeder and the Fun Speeder. Play this innovative outdoor game on the beach, in the park and backyard. Fun without restrictions - no net or court required. The unique, newly developed Speedminton HELI Speeder is characterized by a four-legged, protruding dress, which slows the flight and guarantees fun even over short distances, and is perfect for beginners and children. The set includes Speedlights, allowing play in twilight and darkness for unlimited fun even after sunset. Speedminton also offers a variety of accessories including cones and the Easy Court. The original Speedminton birdies, the Speeder are produced exclusively in Germany using high-quality, robust and recyclable high-tech plastics from Switzerland. SPEEDMINTON: The innovative racket game that requires no net. 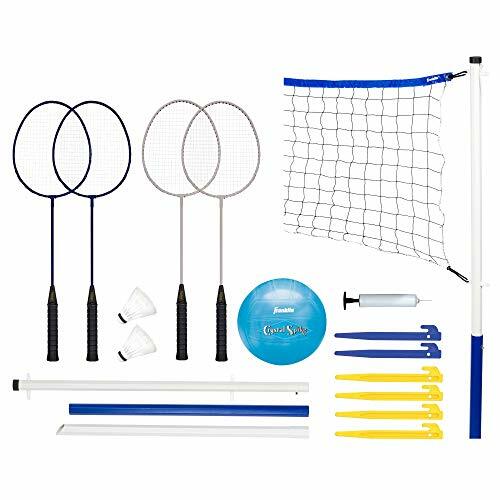 The FUN set is perfect over short distances, beginners and the whole family as well as for the beach, park or backyard as an alternative outdoor game to badminton, spike ball or beach ball. RACKETS: 2 original FUN Speedminton rackets, short and light, made of high quality aluminum. SPEEDER: 2 innovative Speedminton birdies for short distances of 5-20m. SPEEDLIGHTS: 2 original Speedminton Speedlights allowing play in twilight and darkness. Lasts approx. 3 hours. ORIGINAL: Speedminton is the leading manufacturer of crossminton / speed badminton equipment as well as official equipment of the ICO (International Crossminton Organization). 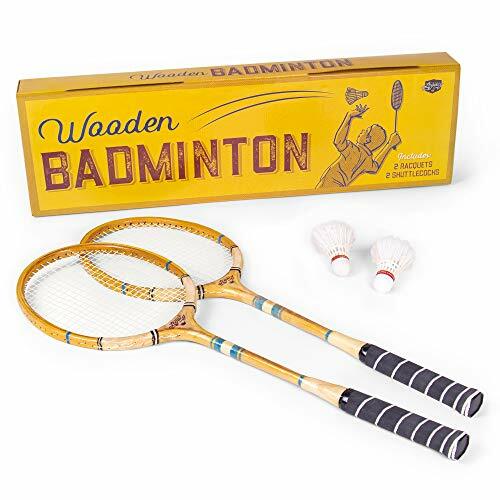 Celebrate the finer games in life with the vintage Wooden Badminton set from Crown Sporting Goods. Sporting two attractive 675mm racquets carved from mulberry wood and strung with gut, along with two premium hen-feather shuttlecocks, your lawn parties just got classier. Enjoy a game of singles with your favorite suitor, or let the guests duke it out for your favor. A royal game must have royal instruments! In accordance with tradition, each of our shuttlecocks is made with 16 hen-feathers, and each racquet hewn within millimeters of the 675mm royal standard. Whether enjoying a day in the gardens or hosting the finest ball in the county, be sure you play with only the best. It's so easy to have fun with your family. Take our badminyon net set with your family to enjoy happy time now. A good relax choice to play with friends or family members. Premium Super White Goose Feathers, comparation with Yonex AS40. 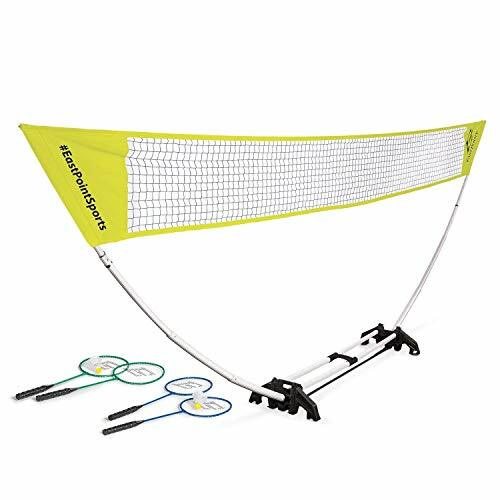 This Portzon badminton set gives you an easy and portable badminton area for your family and friends. With such a quality equipment, you will enjoy some recreation and at the same time get some good exercise. Click the "ADD TO CART" button now! Hope our products can bring more fun to your life.